Observation - Six-spot Burnet - UK and Ireland. 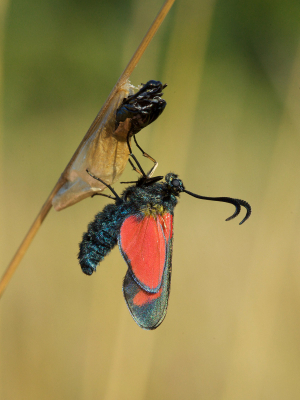 Description: A newly emerged, adult Six-spot Burnet drying its wings. Once they are hardened it will fold them downwards. Taken with Canon 5DMkII and 100 mm macro lens. A newly emerged, adult Six-spot Burnet drying its wings. Once they are hardened it will fold them downwards. Taken with Canon 5DMkII and 100 mm macro lens.